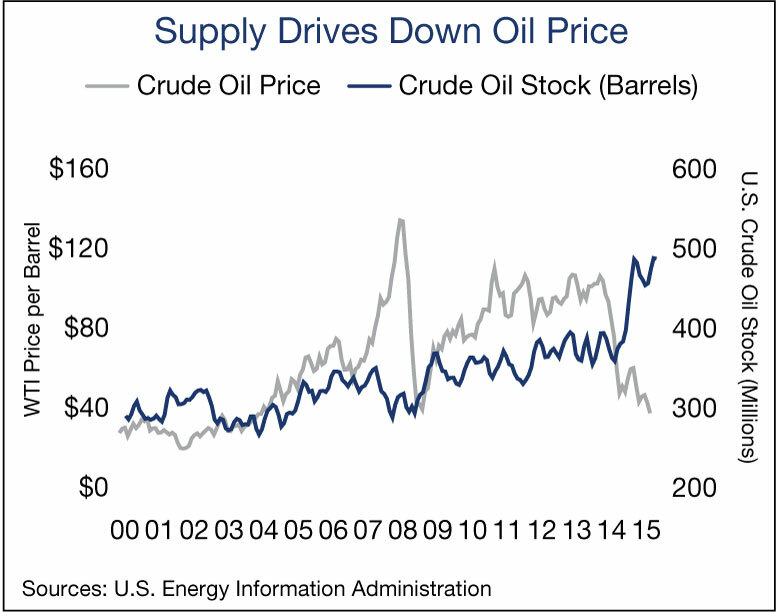 A substantial increase in supply ignited a steep decline in the price of crude oil over the past year. U.S. crude inventory has increased more than 20 percent since year-end 2014 and OPEC members continue to pump at elevated levels in an attempt to weaken U.S. producers. The supply glut and downward price pressure could potentially worsen as Iran ramps up production as sanctions are lifted and the U.S. exhausts storage capacity. These trends have ruffled global financial markets and posed questions on how deeply problems in the energy sector will affect other segments of the reasonably strong U.S. economy. Lower dependence on imported oil in the U.S. has come at an unanticipated cost. Previous declines in oil prices have enabled domestic consumers to save at the gas pump and spend on other items, while taking money out of the hands of foreign producers. Increasingly, savings at the pump have come at the expense of domestic producers, triggering reductions in U.S. energy-sector budgets and layoffs that impact economies in oil-producing regions. U.S. consumers pocketed an aggregate $115 billion from lower gas prices in 2015, yet the savings did not translate into large increases in retail sales. Personal savings rose by more than $100 billion last year, suggesting that the savings at the pump are not recirculating through the economy. Energy-sector layoffs involving more than 94,000 workers represented a scant 0.1 percent of total payrolls in the U.S. at the end of 2015. While the effects of energy-sector turmoil on overall employment trends are muted, domestic financial-services companies face uncertainties. Collapsing oil prices have distressed bonds linked to oil and gas firms, and banks including JPMorgan Chase and Wells Fargo are setting aside billions to cover potential losses. Many lenders remain reluctant to press for payment of outstanding balances at the risk of potentially bankrupting energy-sector companies, a situation echoing the extension of repayment schedules in the mortgage market during the financial crisis. Potentially higher yields on lower-rated energy-sector bonds may also raise rates on other borrowing. Nationwide, U.S. office vacancy fell to 14.9 percent behind growing demand and the average rent rose more than 4 percent during the year. Energy-sector cutbacks in spending and staffing were evident in markets with higher concentrations of oil-related workers, including Houston and Oklahoma City, raising the vacancy rate in both metros as some tenants closed. Sublease space is also likely to rise in the coming year as hiring subsides. Declining activity in the oil fields will potentially reduce demand in the coming months for warehouse space used for the storage and distribution of drilling equipment and supplies. Nonetheless, national trends appear sound, with retailers and e-commerce tenants capable of picking up the slack created by a loss of demand related to energy-sector tenants. U.S. vacancy fell 50 basis points to 6.5 percent last year. This entry was written by marcusmillichap, posted on February 2, 2016 at 10:45 pm, filed under Uncategorized. Bookmark the permalink. Follow any comments here with the RSS feed for this post. Post a comment or leave a trackback: Trackback URL.